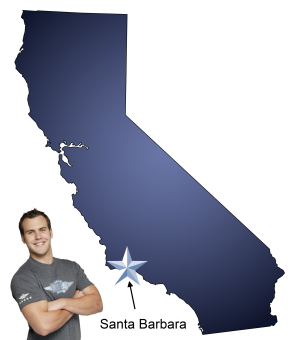 Whatever your moving needs may be, Meathead Movers will help you feel at home in Santa Barbara. Our professionally trained student-athlete movers and our moving concierge will be with you for the entirety of your move to Santa Barbara. Welcome to Meathead Movers of Santa Barbara! If you are moving to or from anywhere in Santa Barbara, we are the moving company for you! Our professionally trained student-athlete movers and our move concierge are here to help you with every stage of your move in the American Riviera. We’ve been the preferred moving company for Santa Barbara residents for over a decade. Our community involvement in this area includes the President of Meathead Movers, Aaron Steed, serving as the co-President of Domestic Violence Solutions, which serves all of Santa Barbara County, continuing our history of commitment to combatting domestic violence and helping those who fall victim to it. Additionally, many of our student-athlete movers have attended either Santa Barbara City College or UCSB. In fact, Aaron speaks to Entrepreneurship students at UCSB every year! Over the years, while moving both the movers and shakers of the entertainment world to their second homes on the Summerland and Montecito coasts or the fourth-generation families out on Hope Ranch, we’ve learned all about what makes Santa Barbara so special. Strolling down State Street, listening to laughter and New Orleans jazz pouring out of the Palace Restaurant, tracing Father Junipero Serra’s footsteps at the Mission Santa Barbara, or watching the competitive beach volleyball games at East Beach are all wonderful ways to pass the time in Santa Barbara. You don’t want to miss the infamous Summer Solstice Parade or Old Spanish Days, where both visitors and residents are entranced by whirling dancers in beautiful costumes, mariachis strolling the streets, and the smells of authentic food wafting through the air. With its perfect weather, beautiful beaches, and charming culture, Santa Barbara is a great place to call home. Whether you are moving to, from or within Santa Barbara, we’re here to support you along the way. Our services range from local moving, long-distance moving, on-site moving for rearranging your home/office or loading rental trucks, and even a distinctive moving concierge service, which connects you with local service providers. In preparation for your move, please make use of our handy Moving Checklist. Also, check out our amazing packing professionals, Princess Packers. These are just a couple tools that we have created to help you with your move. We know moving is stressful, but it’s our job to ease your transition and we take pride in doing so. When you entrust your move to Meathead, you can rest assured that your move will be a success because our professionally trained student-athlete movers are the best movers the industry has to offer. Call us today for a free no-obligation moving quote and find out how Meathead can help you. Moving to Santa Barbara? Here are some helpful resources. View more Santa Barbara resources. Students arrived ontime with a positive attitude. They were detail oriented with their care for the items and quick to get the job done. We were very impressed with the movers as well as all staff members that handled our moveSanta Barbara. Everyone was polite, calm and professional from the initial booking to the clean up after the move Great job everyone! We highly recommend Meathead Movers. Pete amd Ed.